Since March this year, the Port of Chennai has been offering shippers free haulage between the Indian city and the port’s container depot, as well as a break on terminal handling charges if they put their cargo on the railroad serving the port instead of using truckers. The measure, which saves shippers about $11.67 on a 40-foot container, is an effort to alleviate the chronic congestion at the port. The port authority and the container facility operator are worried that the notorious bottleneck could prompt customers to route their traffic through other ports. In the United States some shippers have looked to rail transportation as a potential solution for mounting problems with road transport. A survey of some 600 shippers conducted by Wolfe Research found a slight diversion from road to rail in the third quarter of last year. The shortage of truck drivers, exacerbated by new driving hour regulations, has pushed up the cost of road transportation and created challenges finding truck capacity, especially on long-haul sectors, observes Bob Imbriani, executive vice president, International at forwarder Team Worldwide. Interest in combining different modes to achieve better transit times or save costs appears to be on the rise. However, shippers have little leverage to shift cargo to rail, Imbriani notes, as the railroads are not set up to deal with them. “The entities that are putting intermodal containers on rail are trucking companies and the ocean carriers. Shippers don’t have any direct contacts with railroads. They work through trucking or intermodal marketing firms,” confirms Albert Saphir, president of logistics consulting and training firm ABS Consult. Trucking firms’ use of railroads to move their trailers has gone up, notes Imbriani. “At one time this was driven by fuel prices, now it is driven by drive availability and driver hours,” he says. 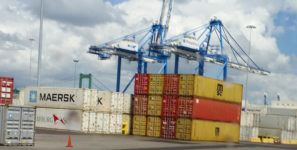 Some U.S. shippers have used airfreight to speed up the time from point of origin to port, reports Jeremy Metz, general manager, Carrier Development of DHL Supply Chain. Imbriani sees merit in the combination of airfreight with ocean transportation in international moves, provided the transit times on the water are relatively short. While there is some use of lanes where airfreight constitutes the first leg, in the main this combination typically features the marine sector before a transit to airfreight. The overwhelming majority of this traffic is out of Asia. Saphir has not seen any outbound sea-air flows in the opposite direction. “Outbound routes to Asia are backhaul lanes, so (airfreight) pricing is much lower than eastbound rates,” he comments, adding that it makes little sense for U.S. shippers to use sea-air to Europe or Latin America either. DHL has seen rising volumes of sea-air flows through Panama from Asia, and the expansion of the Panama Canal will likely bring a further boost to this, Metz believes. For the most part, this traffic is headed to markets in Latin America. The main sea-air routes out of Asia are from Singapore to the United Arab Emirates for connecting flights to Europe (and small amounts moving on to North America) and across the Pacific to Los Angeles. “We have seen some large retail customers bring freight to L.A. and put it on a plane. Normally this would have gone on trucks,” says Richard Zablocki, vice president, Global Product Development, North America at CEVA Logistics. He adds that this is likely a temporary measure in response to supply chain problems and has already shown signs of slowing down. According to DHL, sea-air can come into play as an alternative to avoid peak season congestion, but in the main it is a strategic option for shippers who find transit times and costs of air and ocean moves not suitable for their requirements. The company claims that its “SEAIR” offering is on average 30 percent to 50 percent faster than ocean freight and 30 percent to 50 percent cheaper than air cargo. Further benefits include confirmed bookings on scheduled departures, control of the shipment from country of origin to final destination and carrier liability insurance for the complete transportation chain. Metz says that the decision on the choice of mode has to balance the requirements of the different functions across the shipper’s organization. While the cost element is relatively straightforward with sea-air, the service part does require some discussion within the company about the trade-offs, he notes. In addition, there are aspects like carbon footprint that may enter the decision process, Metz says. Imbriani stresses the importance of looking at the full picture. “Look at the total cost—all the cost of handling, re-handling, insurance and final delivery. Combining two modes brings in different charges,” he cautions. By the same token, shippers need full visibility across the different modes involved to be able to trace their shipment along the route and ensure there are no hiccups at the interfaces, Metz points out. “You need smooth transitions. It’s got to be a seamless process and operation,” he emphasizes. To that end, it is critical to capture the traffic data of all the elements along the chain, which will help evaluate the performance of the various providers involved. Having a full set of data (preferably in electronic format) also makes a difference when it comes to regulatory issues, notably customs clearance and security. Shippers are free to organize and align the individual elements themselves, but such an approach pushes up the risk of disruption along the way, besides taking up a lot of time and effort, notes Metz. “You need someone who has end-to-end visibility,” he says, adding that only the large international logistics providers usually have this capability. Imbriani notes that shippers who look to use sea-air should be mindful of security regulations along the way. “If sea-air programs transit the U.S., you will have to use cargo-only aircraft. The shippers at the origin of the goods are not considered known shippers by the U.S. authorities, and there is no chain of custody to match the requirements in U.S. security regulations for air cargo, so you cannot use passenger aircraft,” he says.